We tend to think of weak bones as being a problem of old age. However, building strong bones is a job for youth. Bone mass is laid down in childhood - we reach our peak bone mass by about the age of 20 - so helping our kids optimize bone health is critical to prevent osteoporosis years later. The stronger our bones become when we're young, the better off we'll be when we're older. Most families know this, and (like the Canada Food Guide advises) diligently ensure their children consume their milk and dairy products. However, the British medical journal recently released a study showing that boosting calcium intake did nothing to prevent fractures. How can this be? Haven't we always been told that milk "does a body good"?? Bone health relies on far more than just calcium. Although it's an important component of healthy bones, there are a range of other nutrients - including vitamin D - that affect the metabolism of bones, kind of like the mortar that holds a strong wall together. Fruit and vegetable consumption alone is an independent predictor of stronger bones. Weight-bearing physical activity puts muscular force onto bones that challenges them to become stronger. It's important to keep the activity to moderate levels during development - the stress of intense training can negatively impact bone development. Minimizing stress reduces cortisol, a hormone that weakens bones, among its other toxic effects. Calcium is still an essential mineral, for bone health and other important bodily functions. However, while dairy is a great source of calcium, despite the best efforts of the Dairy Board to convince us otherwise, dairy need not be its own food group. 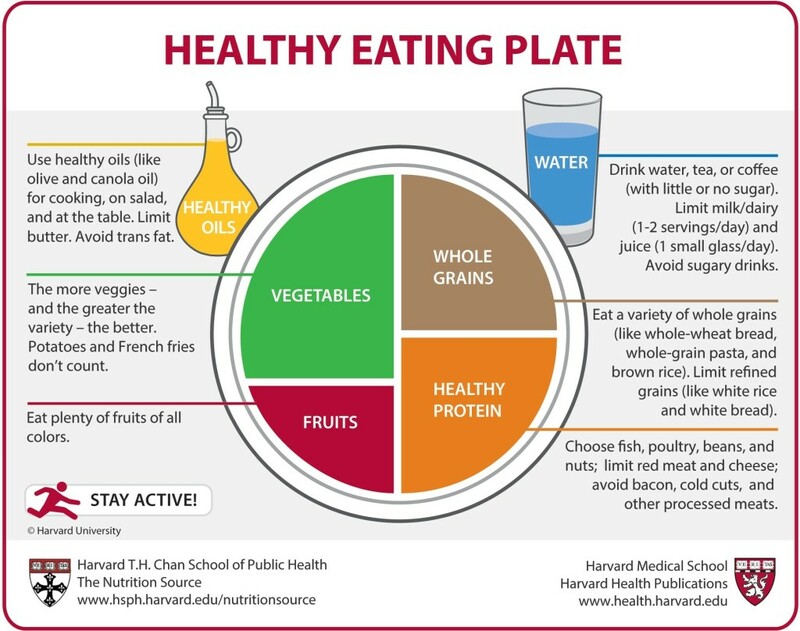 The Mediterranean dietary guidelines minimize dairy as its own food group, as does the Harvard School of Public Health - note the conspicuous inclusion of healthy oils in both images as well - important for metabolic and immune system function. Nuts and seeds are a great source of calcium; eaten whole, or in their "butter" form, they're a delicious way to boost intake. Try almond butter on your toast, or add tahini (sesame seed butter) to your dips, soups and sauces. Green leafy vegetables contain calcium, and provide additional benefits of fiber and vitamin K, both helpful to bone health. Tofu (made from organic, non-GMO soy) is an excellent source of calcium; the phytoestrogenic effect of the soy may also benefit bone health after menopause. Stir-fried kale and tofu with a tahini sauce gives a powerful hit of not only calcium, but many other nutrients necessary for bone health. Although I'm not generally an advocate of canned foods, I do like canned wild salmon or other cold-water fish with bones as a source of both calcium and omega-3 fatty acids - use it to make delicious salmon burgers, or mix into a green salad. Strong bones require minimal inflammation, and the healthy fats from wild fish are a helpful way to reduce it in the body. If you or your child do well with dairy (signs that you don't might include eczema, sinus congestion, frequent ear infections, digestive difficulties, or behaviour struggles - come see me to discuss if a trial elimination might be a good idea), it can definitely be included in a balanced diet. Goat and sheep products are often better tolerated than cow, and have a pleasant flavour. There are many delicious varieties of cheese from around the world to try. Our family loves fermented dairy in the form of yogurt as an excellent way to support healthy gut bacteria - it's super easy to make at home, and you'll get more bacteria bang for your buck! See below for instructions how! So get out with your kids to jump on a trampoline, swing around the playground, skip rope or have a dance party! Adults can go for a run or hit the gym for the same physical benefits, but it's not always as fun for some folks. The activity loads your bones to make them stronger, and helps to reduce the negative impacts of stress. Being outside while you do it gives that extra vitamin D that is so important. Eating a Mediterranean-style diet (lots of fruits and vegetables, whole grains, plant-based proteins, healthy oils) will create the best possible nutritional environment for bones. It's so important to create an opportunity for kids' bones to develop properly, and for those of us who are past that prime time, we can keep our bones as strong as possible using the same principles. Have fun! Heat milk in a stainless steel pan over medium heat until it reaches 180 degrees - just under boiling. Stir gently to avoid scorching the bottom. Remove from heat and let cool, either by sitting on the counter or in a cool water bath until the temperature drops to 115 degrees, or just so it's cool enough to drop on the inside of your wrist. Pour a bit of cooled milk to your starter - either store bought yogurt or from a previous batch. Lightly stir. Pour back into the pot of milk and stir gently. Pour the milk into the two glass dishes, place on the lid, and wrap each in a towel. Place the bundles into the (turned off) oven for 12-24 hours. Put jars into the refrigerator until they yogurt is cold and set. You can strain the yogurt using cheesecloth for a thicker consistency ("Greek" yogurt) or stir it into the bowl. Keep the lid on your small dish to keep bacteria out until you're ready to use it as a starter the next time. God has been on my mind quite a bit lately. I have wrestled with the nature of God for much of my life - curious about the relationship between an omnipotent/omniscient/benevolent character and the horrors that occur all the time. The miracle of what appears to be intelligent design, and how that intersects with my strong confidence in the amazing process of evolution. Curious about the personification of a higher power as opposed to a unifying energy that connects us to each other, to the natural world and beyond - while being aware that these two possibilities are not mutually exclusive. Curious about the nature of love and compassion; our role and responsibility in this finite lifetime - what comes after, and if it is relevant to the decisions we make here and now. The essence of "faith" is to believe in something that can't be proven; to trust that something else - some power other than ourselves - is in control. It's a scary thing - to yield control and to admit vulnerability. The surrender required feels like taking a leap into a void ... faith implies a confidence that we will be lovingly embraced in the free fall, and that all will work out. ​I'm certainly not a philosopher, and others have thought and written about these issues with far more depth and insight than I ever could. However, some concepts have gelled for me recently that I wanted to share. Years ago, someone advised me that "nothing worth having was upstream." This abraded my sense of perseverance and ambition. Drive, accomplishment ... it seemed like in order to be successful and achieve anything of value, one MUST paddle upstream! I couldn't make sense of it. For years. A friend recently suggested that paddling downstream still requires effort. The difference is that everything else is conspiring to propel you along. My work this year engaging in the sponsorship for a family seeking refuge from Syria has felt like paddling downstream. It has required effort. It has taken time and brain power and compromise. But - with the exception of a few small rocks in the stream around which we've had to negotiate - everything seems to be conspiring to propel us along. The money flowed in; an apartment was offered to us free of rent; we have more contributions that we know what to do with; healthcare providers are offering their services; the community has come together to make this beautiful act of love and compassion a reality. Is this God? Is this the higher power? Is the divine present in loving community, in many hands making light work? When we let go - launch ourselves into the stream and go with the flow ... perhaps God is there. I'd be curious to hear your thoughts ... please share them with me.